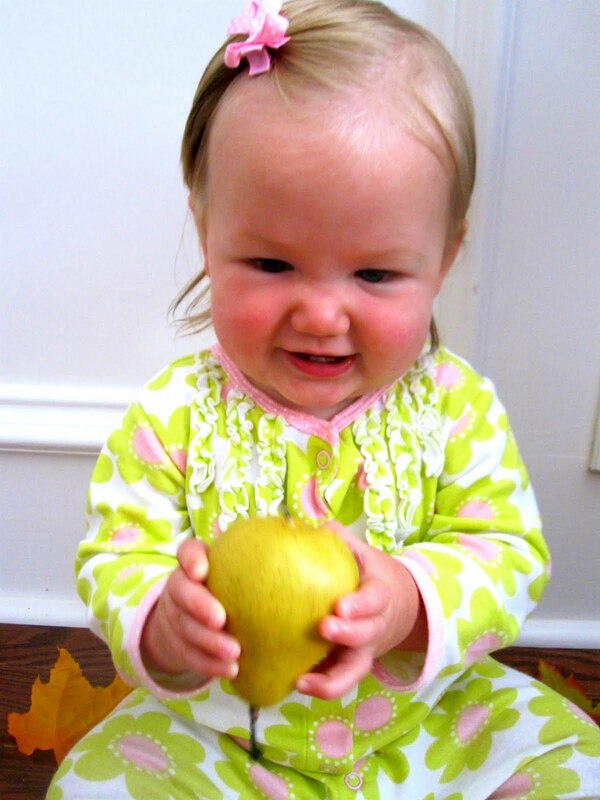 My baby is nine months old now and is starting to need more to entertain her than a chew toy. On Fridays my son goes to a Mom's Morning Out program... so I'm going to try and start doing a few more activities with her on those days... in between running errands. I'll share them from time to time. 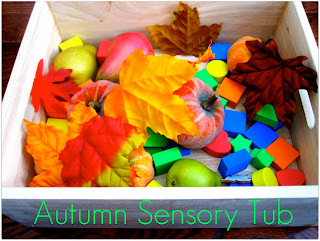 Today we created an Autumn sensory tub and sang Fall themed songs. We had a lot of fun. She is very social and loves having my undivided attention. Sensory tub objects: plastic fruits (pears and apples), plasticky/fabric leaves, and some foam shapes. The leaves were her favorite part. I would throw them over her head and they fell down and tickled her face. This was definitely a great mommy/daughter bonding activity. I loved having a chance to see her personality separate from her brother (who tends to steal the show). While we touched the different objects we talked about how they felt, what they looked like, and what we could do with them... and then mostly we just explored and had fun! We also sang "Leaves Are Falling" (this song called Rain is Falling, but we changed rain to leaves. I like it because it accompanies us while we sing :)) She bounced while we sang and clapped. We ended our discovery time by singing/watching Cullen's ABCs and her version of Autum Leaves are Falling Down. I think I am really going to enjoy this special mommy/baby bonding time with my little cutie. Pass along any other good baby sensory tub ideas! 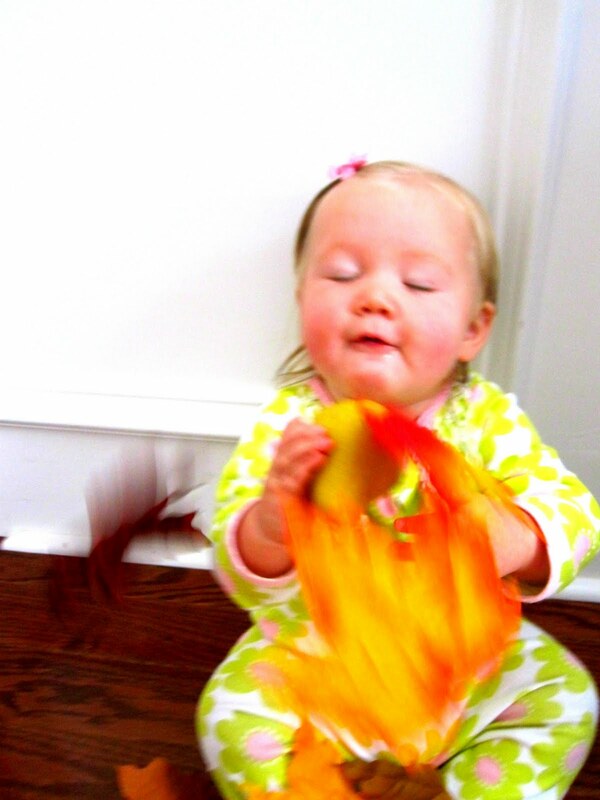 ** Note: this is an activity that requires parent supervision. 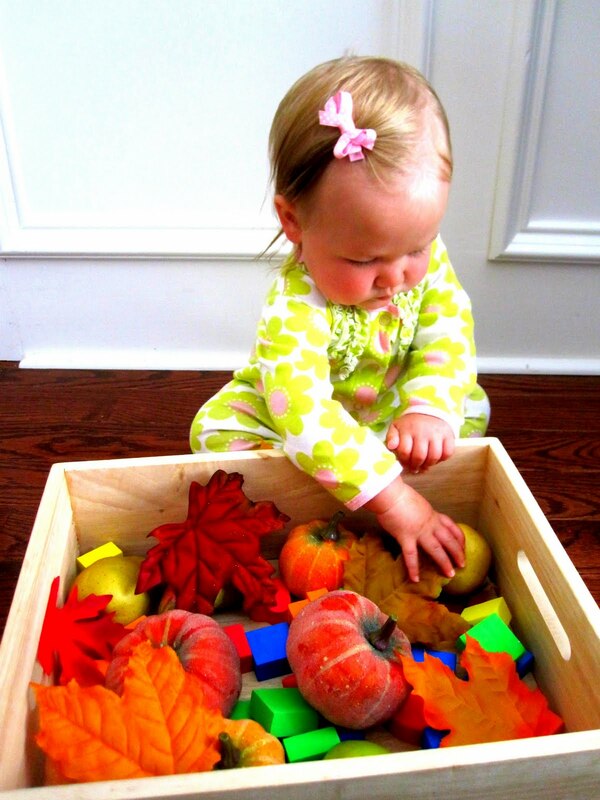 All baby playtime activities are to promote language development/sensory awareness and allow time for parent/child bonding... they are not independent activities! Yours is very cute though---I even saw those shapes in the dollar bin and contemplated getting them!